Add 1/4 cup grated parmesan cheese, egg, sour cream, lemon zest, 1 tbsp chives, salt and cayenne pepper and mix together. 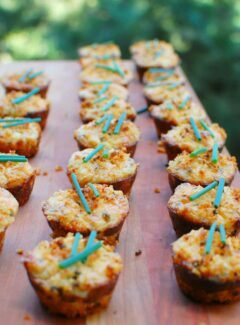 Combine Panko bread crumbs, 1/2 cup grated parmesan cheese and 2 tbsp chopped chives in a medium sized bowl. Place about 2 tsp of the bread crumb mixture into each cup, and use your index finger to form an indent.